Sara is a native Marylander and a cradle Episcopalian. She spent a few years down south at Elon University getting her B.A. in Religious Studies. After feeling the “nudge” of God toward a calling to ordination, Sara went to seminary at Yale Divinity School and Berkley Divinity school in New Haven, CT, where she received her Masters of Divinity and Masters of Sacred Theology in Christian Ethics. Sara is currently working on her Doctor of Divinity through Episcopal Divinity School in Cambridge, MA; her doctoral work focuses on reimagining the church for the twenty-first century. Sara is a 2015-2016 Beatitudes Society Fellow. She is the chair of the Task Force for Leveraging Social Media for Evangelism, an Interim Body of the Episcopal Church’s General Convention. 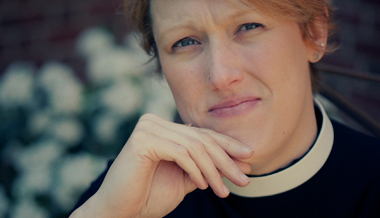 From 2010 to 2014, Sara served as Canon for Spiritual Formation at the Cathedral of the Incarnation in Baltimore, Maryland. Until November 2015 she served as an Assisting Priest at Trinity Episcopal Church in Towson, Maryland. Currently Sara serves as one of three “co-pastors” of the Slate Project, a post-denominational Christian community rooted in the ancient, the arts, and the commitment to acting for social justice, located both in Baltimore, Maryland and online. The Slate Project asks what the church could be if it had a “blank slate” and is all about searching for “Christianity without the crap.” Sara and her wife Heather live in Baltimore with two crazy dogs and one unusually social cat. For fun Sara likes to go running, make pottery, write poetry, travel, and attempt to have a yoga practice. You can follow Sara on twitter at @revshiz and on her blog, theseekersway.com. Sara contributes to the Transforming Through Love series HERE.